The M4A2 Sherman was the most numerous production variant of the Sherman Tank produced by the US during WWII with 8053 75mm armed variants and 2,915 76mm armed variants being produced. It was also the Sherman that served with the most number of user nations. 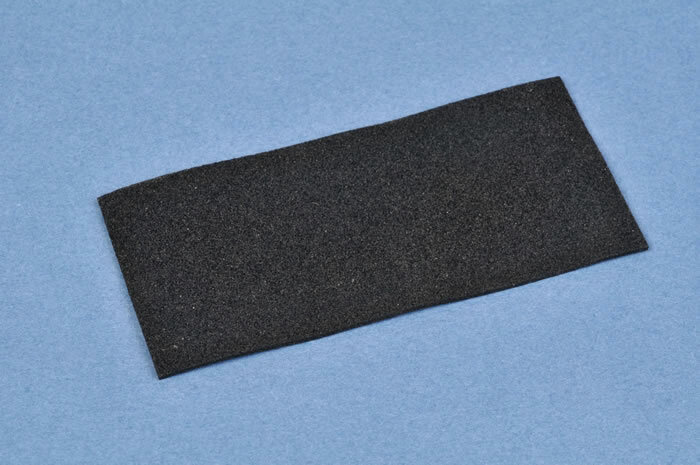 The UK, Canada, France, Poland, New Zealand, USSR and the US Marines used them in action. The diesel powered M4A2 had many sub variants. The so-called Cast Hood version now follows on from Tasca’s excellent 1:35 scale DV kits. 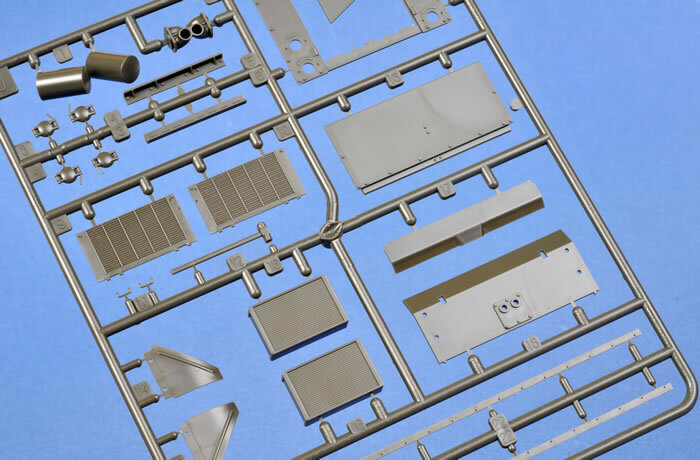 This kit represents a mid-production vehicle and has a hull configuration likely to have been produced by either Pullman or Federal Machine & Welder. The M4A2 Shermans were, with the exception of the USMC and US Army stateside training, reserved for Lend Lease. The UK was a major beneficiary, taking deliveries of thousands of M4A2’s. The M4A2 was the backbone of Commonwealth & Polish tank strength in the Mediterranean until replaced by the late M4A1 76 mm variants in British and South African armoured formations. It remained the principal tank in New Zealand and Polish formations in Italy until the war’s end. Two British and one Canadian Brigade were equipped with the M4A2 for the invasion of Europe. Many also landed with the French and served with the USSR. The kit is based on Tasca’s earlier released 1:35 scale M4A2 DV and shares the majority of parts from this kit and other Tasca Shermans, although this one is moulded in olive coloured styrene. The major differences are the new hull part, which has a late configuration mid-production glacis with the cast hoods. 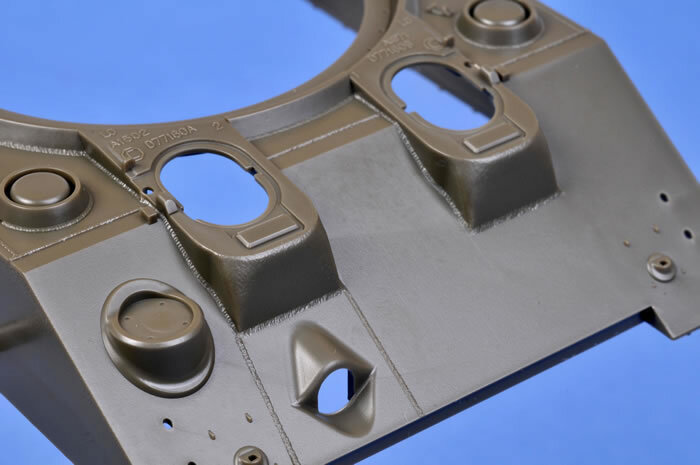 These are superbly moulded and Tasca has captured the complex shape of the modified DV Hood castings exceptionally well including the correct cast numbers and foundry marks. 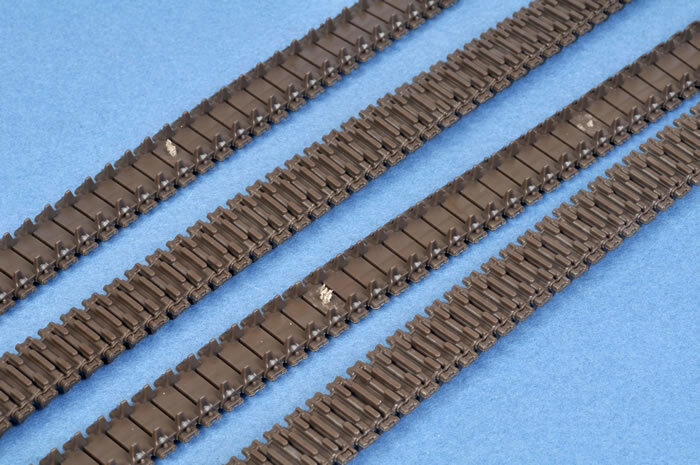 Other differences are the tracks, which represent the T49 – three bar cleated steel track - and the new pattern British turret stowage box which was frequently seen on UK and Commonwealth M4A2s. 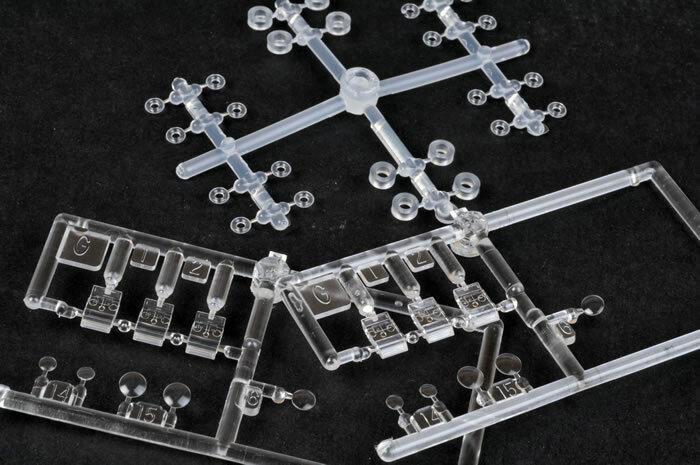 Similar to the earlier releases, this kit offers the clear parts in the form of periscopes and lenses for the driving lights. It also includes the excellent Tasca .50 cal M2 machine gun, which has both the small and later larger ammo cans. 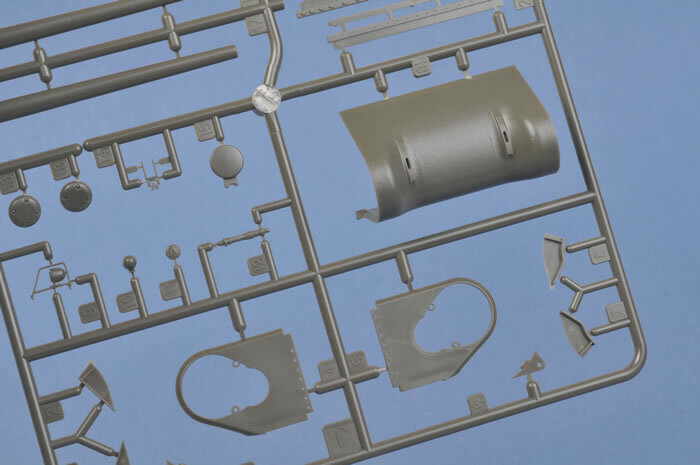 British smoke dischargers, antenna mounts and even biscuit 7 oil tins are included although the US style jerry cans are not. 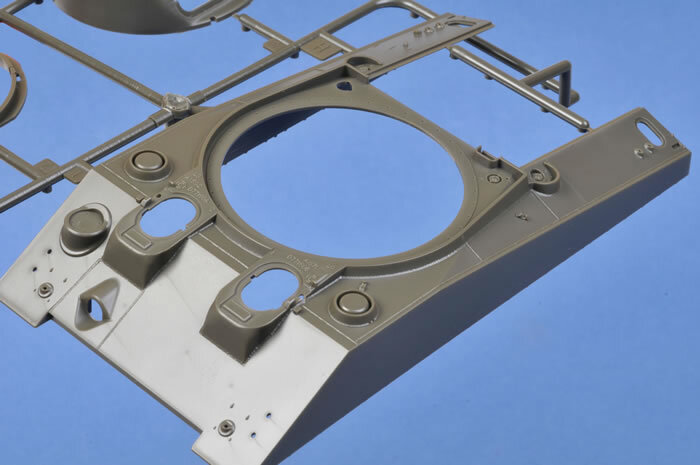 Photo-etch is again offered for the light guards (also supplied in plastic) along with the jig introduced in their first Sherman kit the VC Firefly. Markings are provided for two British vehicles that saw service in Normandy with 27th and 8th Armoured Brigades. Given the breadth of service these variants had I would have expected a larger selection of marking options such as Polish, USSR, French, Canadian and New Zealand examples. These were extremely colourful vehicles in service offering a great variety of schemes and markings. HQ Sqn 24th Lancers 8th Armoured Brigade June 1944 Normandy. This vehicle has the T number 152881 and appears based on IWM photo IWMB6218 which appears in Fortins British Tanks in Normandy on page 55. A Squadron, Staffordshire Yeomanry, 27 Armoured Brigade July 1944 Normandy. This vehicle has the name “AVENGER” in white outline but has no T number. It appears to be based on IWMB7558 seen on page 63 of British Tanks in Normandy. 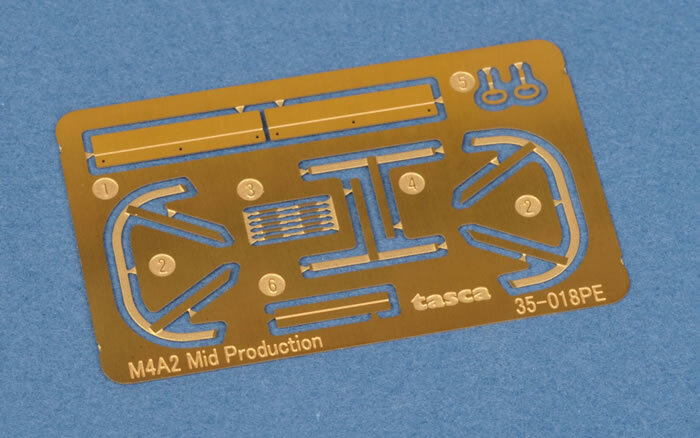 This kit maintains Tasca’s high standards and is by far the best cast hood hull M4A2 yet kitted in plastic. 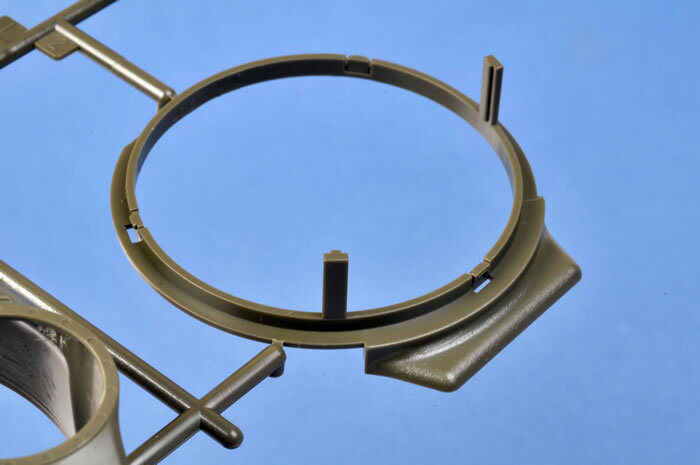 It is not without criticism however and I feel the hatch positive locks are not represented as well as they could be, appearing as small blobs whilst the one piece differential is not quite as “beefy” as it should be. 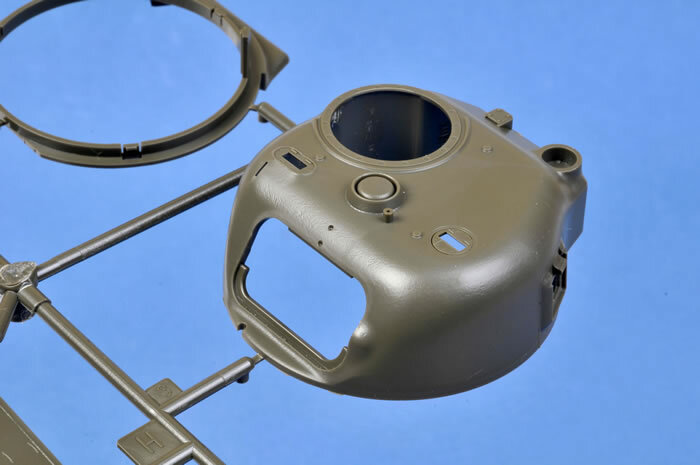 These are easy to fix areas and it goes to prove that the perfect Sherman kit is still out there somewhere although in its absence these are the next best thing. DML is getting a lot better with each new Sherman release too. 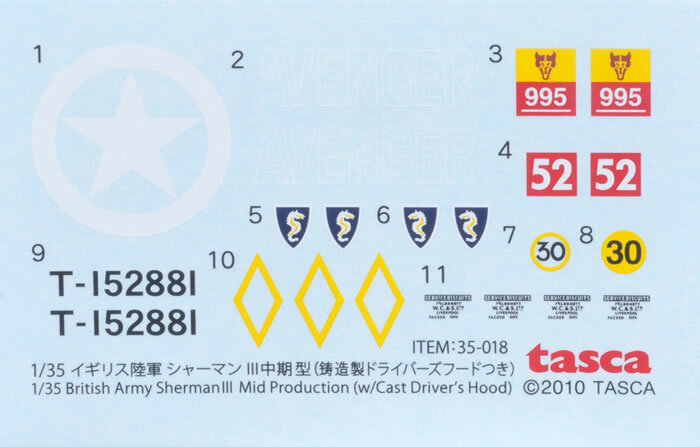 I’m sure the competition is a healthy thing for the consumer with better and better Sherman Kits gracing the shelves.. By using aftermarket decals, a string of colourful Shermans can soon grace modellers’ shelves. 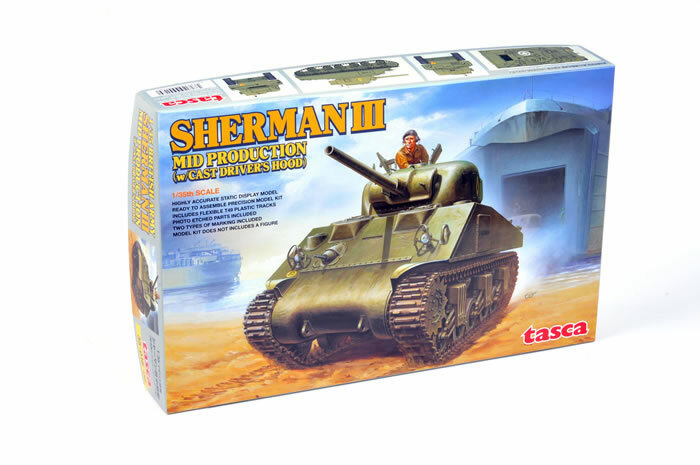 A stunning mid production M4A2 Sherman can be made from Tasca’s kit and a lot of very useful parts will be added to the spares box, such as their excellent (and correct) cupola and hatches, rail kit and sandshields. It took years for the M4A2 to appear in plastic but this eclipses what was already a great kit of the subject released by DML.